The cliff below is the height most jump from… for photos of my jump go to the bottom of the article. 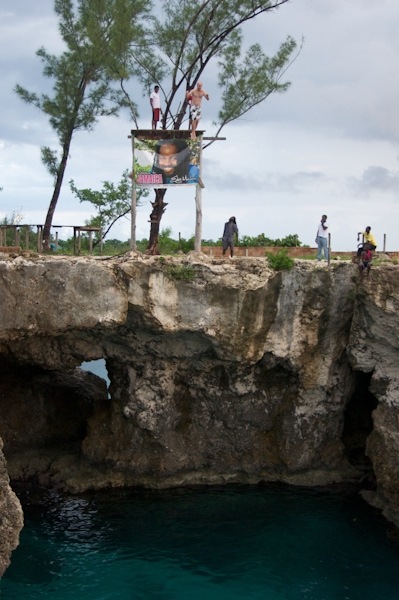 Groups of people encircle a pool of pale blue water with their eyes set eagerly to the manicured cliff that stretches from the sea. At the edge a brave soul steps up to the challenge and launches off into the cove flailing their arms in hopes of somehow finding balance. Onlookers hold their breaths partly hoping for a clean entry but curious to see what a cannon ball would look like from a 40 foot jump. The diver splashes clean through the water creating a ripple of white sea water and then pops to the surface with a grin, if not a smile. The hearts of viewers dance with emotion as they contemplate tossing themselves off the cliff as well. The thought alone puts sends the senses of many to a state of vertigo. 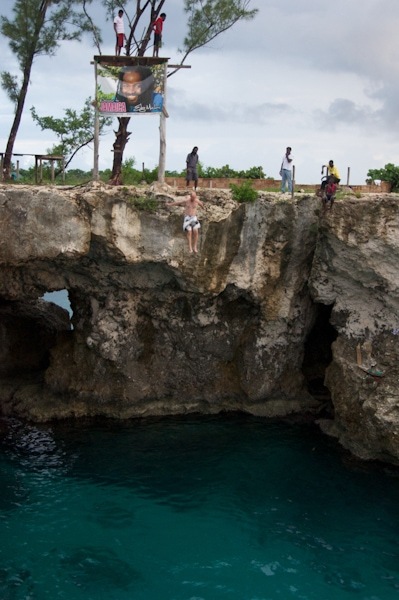 At Rick’s Bar in Negril, Jamaica cliff jumping isn’t just an activity, it is a proving grounds, not to the people who encircle the natural pool, but yourself. 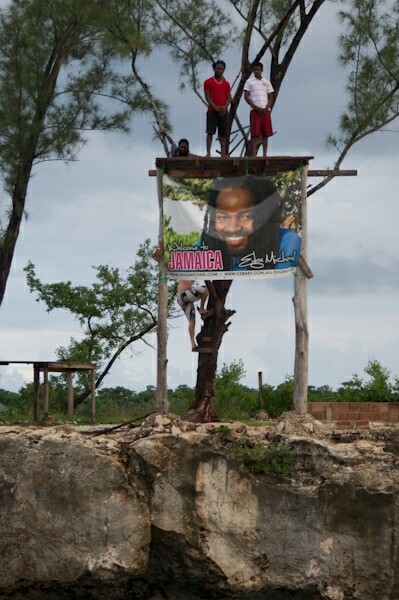 Every now and then someone with a slight tendency to the suicidal makes the jump for the billboard – only locals were seen jumping from it while we were there. The true test, however, isn’t so much the jump but the climb. 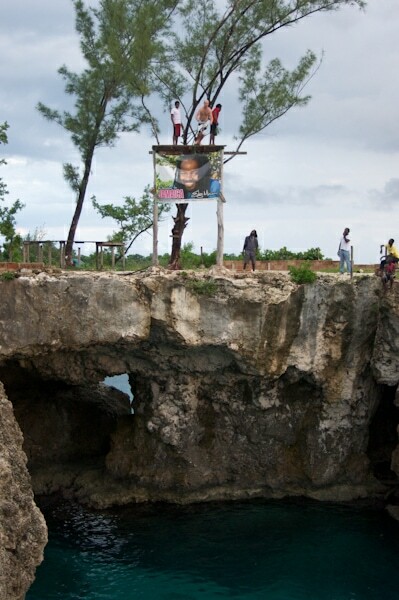 After scaling the rock face on the other side of the pool, you have to climb a tree, bounce your way along one of the rickety branches and then pull yourself up to the top. 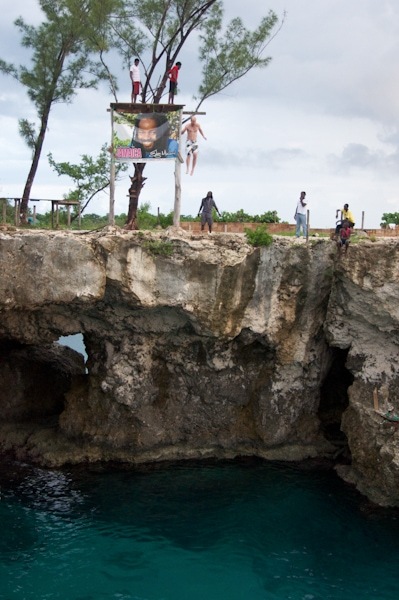 I take a bit of a running start as I fly into the water based pit below. I have every intention of yelling the word “Jamaica” as I fly down, but my lungs can instead only press out the word “Juuugghhhhh.” I flap my hands on the decent somehow thinking that will control my flight. The soles of my feet finally slap the water with a heavy thud and I push my leg foward as to no dive too deep. I can feel the rush of white salt water race along the smooth skin of my back now charged with energy. From below the sea’s surface I see the rays of the sun creating a path of light through the waters. My feet scamper as I push through the salt film surface and stretch my head into the setting sunlight. I look up to the crowds looking for symbolic pats on the back in the form of clapping hands, but the air is silent. I realize though, as usual, the true respect I wanted to gain wasn’t from the crowd, but from myself. Maybe not the world’s smoothest entry, but it will do the trick! Awesome!!! I should have done that while I was there. So great you got pics! 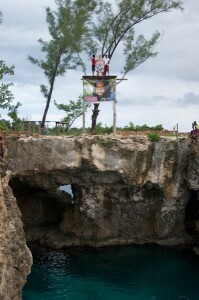 Oh man I am such a chicken but love cliff diving. It normally takes me about an hour to work the nerves to do it. Love the shots you got! You forgot to protect your twig and berries! Thanks Ted… I’ll take credit for the jumping but Reid gets all the credit for the photos! 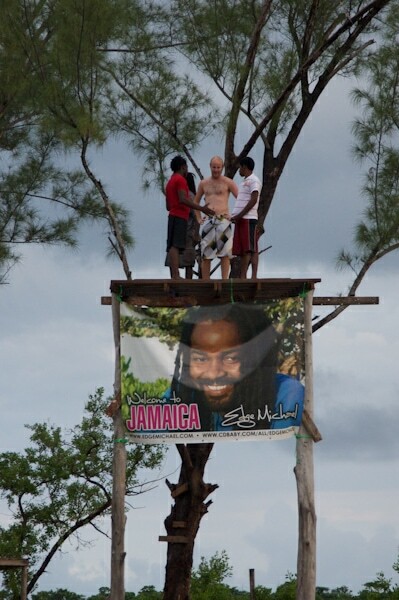 I made the jump at Rick’s back in 2008…glad it’s still there. What a thrill! That looks WAY too scary for this guy. I admire your bravery! I’d try any adventure on my travels. 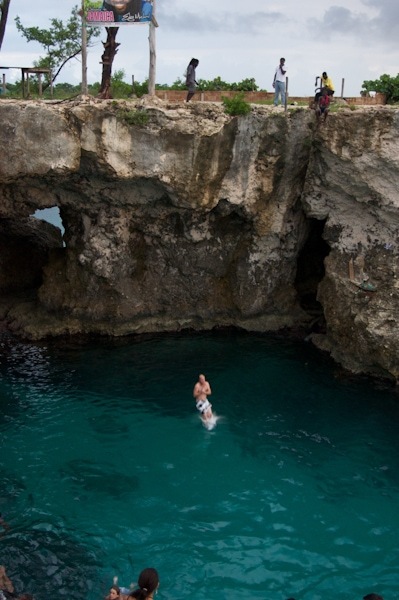 Cliff diving is not one of them! Hats off to you for being so brave! Shirlene, but is soooo much fun!! !